Luxurious Accommodations at Harrahs Laughlin Harrahs Laughlin has 1505 rooms which includes 158 suites each beautifully decorated in south-of-the-border style and equipped with everything you will need to make your stay memorable including several hotel floors for our non-smoking guests. Relax in comfort with world-class amenities exceptional service and spacious rooms some with beautiful views of the Colorado River. For your comfort and convenience we have made sure our guest rooms at Harrahs Laughlin have all the amenities you are looking for. A credit card will be required to reserve your room when making reservations on-line. If you prefer to mail in a check or money order please make reservations by calling 1-800-HARRAHS. Non-cancellation within 72 hours before arrival will result in a 50 dollar penalty charge to your credit card. Holiday or special event periods may require more advance notice for cancellation. Please inquire with booking agent at 1-800-HARRAHS. 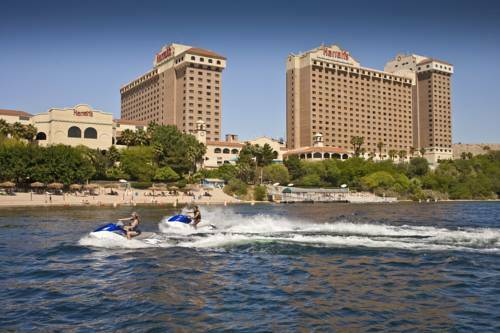 Harrahs Laughlin is within driving distance of McCarran International Airport in Las Vegas. Just less than 100 miles away.